I found this article on Dayton Daily News and wanted to write about it due to how it hits closer to home. If you didn’t hear, the Miami Valley Silverbacks are now moving to Hara Arena in Trotwood and renaming themselves the Dayton Silverbacks. Last season, Miami Valley played as a road-only team, having no place to call home to play some gridiron. From 2006-2009, the Silverbacks called Hobart Arena their home. In the five year history, the Silverbacks are 16-43 while making the playoffs in 2007 and 2010. This brings two teams into the seasoned Hara Arena, the Silverbacks and the Dayton Gems hockey team. While the best record ever recorded by the franchise was a 4-6 record (that’s the best in terms of winning percentage; most wins in a season is 5) in 2010, this is a young franchise. If you look at the front page of the Dayton Silverbacks’ website, you’ll see that there is no lack of passion for this team. There are new logos already for this team, which stay fiercely loyal to Miami Valley’s old logos. This is not the first time football has been played in Hara Arena, however. In 2007, as a surprise move by all employees of the Cincinnati Marshals, the Hara Arena saw an indoor football team simply names, “The Marshals.” However, this team would only go 2-5 and fold later in the season along with the National Indoor Football League. 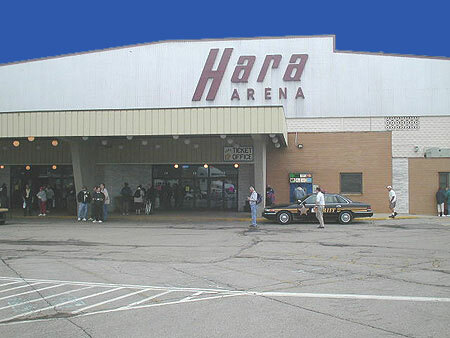 This move will make Hara Arena even busier with hockey and football, along with other events the arena holds on a regular basis. The Silverbacks will continue to play in the CIFL (Continental Indoor Football League) along with a local rival in the Cincinnati Commandos, who won the CIFL title in 2010 with a 10-1 record. If you are itching for some football during the NFL offseason, this is your chance Dayton locals. By theleewmowen in Professional Sports on October 22, 2010 .